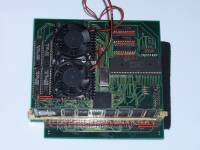 The 040EXCEL is a 68040 CPU accelerator board for the XVI/Super series and was manufactured by Makio Suzu. All signs point to it being a doujin effort and not a wide release. It has a 68040 33 mhz as stock, but with some bios/PLD/regulator changes, it can be upgraded to a 68060 CPU. The board also has a slot for SDRAM and up to 256MB can be inserted into the slot. The first 12MB will fill the 68000's regular memory, while the remainder will go to the high memory address. https://nfggames.com/X68000/Misc/040+060Excel.zip CPLD Code for both 040/060, Drivers/SramPatch and Bios for 060.